The political leaders of BRICS member countries are facing pivotal national moments. Brazilian President Dilma Rousseff is simultaneously navigating her socialist and internationalist moment, after a face-off with the Americans on the NSA spying saga. She has reasserted Brazil’s propositional role in the global order by hosting the ambitious NETmundial – Global Multistakeholder Meeting on the Future of Internet Governance. Russian President Vladimir Putin’s European misadventures have gotten him embroiled in a controversial international debate on sovereignty, while his country’s economy struggles to overcome structural flaws. On the back of a decisive popular mandate, the new Indian Prime Minister Narendra Modi faces tough regional challenges, even as he tries to revive industrial output and create jobs. Chinese President Xi Jinping is in charge of an administration which has courted altercations on various fronts while in search of a new and sustainable model for economic growth. And recently re-elected South African President Jacob Zuma has to contend with both a weak political mandate and rising socioeconomic inequity, while attempting to reconcile differences with African neighbors. Each of the BRICS leaders is faced with significant challenges. How useful will coordination and cooperation at the BRICS platform be for each of them? 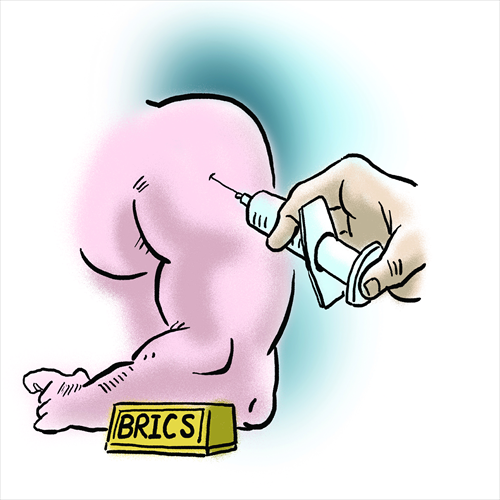 The BRICS platform itself will first need doses of steroids if it is to remain viable. This past year has been quite unsettling for those interested and invested in BRICS. Economic growth of the member countries has been below par. The external economic environment has not been favorable either. The promise of BRICS is based on new economic and political opportunities. The group is lean and lithe by design and therefore has the right ingredients to make for a 21st century cooperation and coordination platform. Both these characteristics were on display when the group met in India in 2012, where a number of forward-looking economic and political decisions were made. However, neither critical decision-making nor effective implementation has been on display over the last year. Relating to this, there are five concerns that must be addressed at this year’s BRICS summit. First of all, the focus of the previous summit was clearly on African issues. The eThekwini Declaration in 2013 focuses on unlocking Africa’s potential, regional integration for Africa’s growth and the New Partnership for Africa’s Development. With the continued moderation of growth rates, the grouping must prioritize domestic economic imperatives and close commercial ties rather than narrowly focus on a single region or use the platform for regional grandstanding. The second concern follows directly from the first. BRICS members have large stakes in the international system and share the common aspiration of becoming global agenda-setters. Indeed, they must not continue to be passive recipients of rules and standards in vital areas such as global trade and investment. Third, the new areas of cooperation listed in last year’s declaration outlining areas for immediate collaboration are strikingly vague. As a result of myopic drafting, a rather counter-productive role reversal has taken place. The interactions between non-government stakeholders have started to lag behind inter-governmental interactions. Governments have limited vocabulary and dynamism compared with the private sector and civil society and intra-BRICS cooperation must be unfettered and creative. An example is the BRICS Exchange Alliance, a market-led initiative to integrate financial trading platforms. Such concrete efforts must be replicated rather than endlessly expand the list of issues to cooperate on for the sake of seeming ambitious. The fourth concern relates to the veritable silence on BRICS engagements in the world media following the high-profile summit last year. Perception-building must take greater precedence at this summit. This must be aided by the timely dissemination of information on actions such as the setting up of the Contingency Reserve Fund and a BRICS-led development bank. And finally, perhaps the most critical issue for the five BRICS leaders, who will meet at the sunny shores of Fortaleza, will be practical goal-setting. This will be an exercise in planning and coordination to maintain continuity as well as honing in on objectives for the long term. If there is an opportunity to be seized in cross-leveraging political and economic ties, it will be in the coming years.